What brands are you most loyal to? There are some brands you probably don't even know you're loyal to (like, Tide, for me) and then others you definitely know you're loyal to (like Apple). 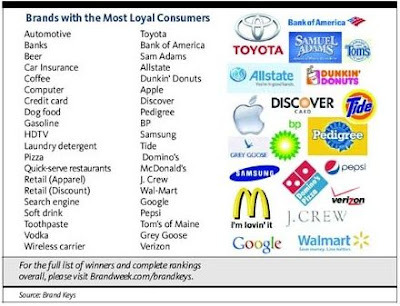 The latest study in Brandweek shows that the brands pictured below are those with the most loyal customers. It looks right to me. What say you? Are you loyal to any of these brands? I know I am. Viciously loyal to some of them. Which are you loyal to and why?